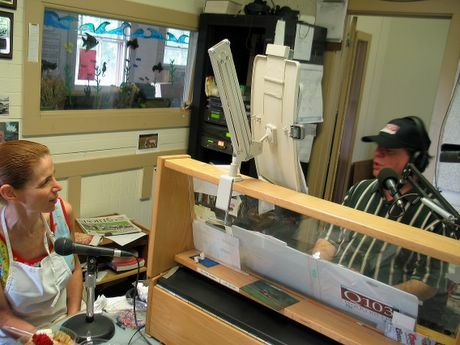 I was invited on our local radio station, WQQQ-FM, a few days ago to talk about an event my organization is hosting, the Family Arts Festival. Joe, the host, is a great guy - easy to talk to and very welcoming to nonprofits like mine. Robin runs the Millerton Market and she comes on every week too - she brought all kinds of delicious food including a savory bread pudding with chili pepper - yum. I love radio - in another life I would have been a talk show host! PS in three days it's my 100th posting - can't wait! 100 posting in three more days, wow congratulation! It looks like you were having a feast. I like radio too, in my house it's always on. Hey, we have a difference of three days:) You must go to that radio station again on sunday for a different interview! wow...do you have a photo of yourself there?